Those of you who know I am on a momcation this weekend might be disappointed that I have yet to put up any new blog posts. My apologies. I am on vacation, you know. In the meantime, I have post over at Arkansas Women Bloggers that you can read if you miss me that bad. This is a guest post by Craig Rechkemmer in response to my previous post about our new garden. 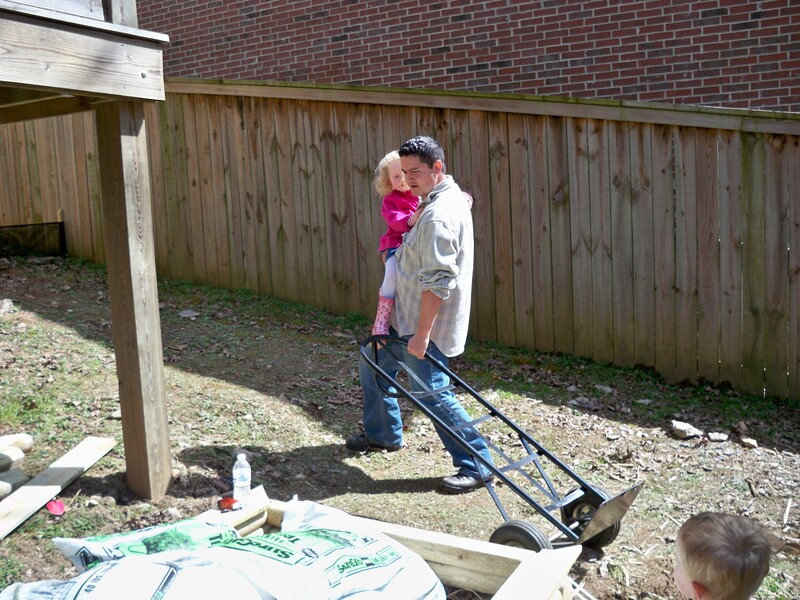 Nice piece… you forgot the instructions of how to build a raised garden bed. Editor’s Note: I was trying to explain to Craig what a blog dynasty is, and was showing him the Pioneer Woman blog. Ever since I showed him this post with pictures of the Pioneer Woman’s husband holding their preschooler in one arm and rustling cattle with the other, he likes to scoop up one of our kids and strike a pose when he thinks he is doing something manly, like building gardens (see picture above). Too bad I can’t take awesome pictures like Pioneer Woman does. Please welcome my first ever guest blogger, Kristen, who has come out of the kitchen long enough to tell us about a fun way to make some extra cash. If someone told you that you have buried treasure in your house, wouldn’t you try to find it? I know I would. I’d enlist the whole family, hand them each a shovel, and tell them to get digging! This is no fairytale: You just might be sitting on a gold mine and not even know it. The treasure I’m referring to isn’t underground and marked by a great big “X.” Instead, it’s most likely packed away in your attic, sitting among your old high school memorabilia, or stuffed in the bottom of your jewelry box. Bracelets, necklaces, rings, and watches that you haven’t worn in years could be worth a ton of money at a gold party. I went to my first gold party completely by accident. I was at a friend’s house one night, and she said she wanted to go by her neighbor’s party for a few minutes. Since I had no idea what went on at a gold party, I was curious and went with her. One of the women who came brought a bag of gold and made several hundred dollars. She was so excited that she went back home to find more jewelry. She returned with another full bag. That night she left with a total of $1,600 cash! After I saw that, I said, “Sign me up!” and hosted my own gold party a few weeks later. Having a gold party was a great experience for me. If you’re interested in making a little extra moolah for the holidays and have considered hosting a party, now is the perfect time. The best part about a gold party is that no one feels pressured to buy anything. Your guests have nothing to lose and everything to gain. In fact, you can tell people to leave their checkbooks and credit cards at home. They won’t need them! Gold is VERY profitable right now. As of 11-17-09, gold sells for $1,136 an ounce. Wow. This is an ideal time to cash in on your gold jewelry while the price is high. It’s an easy way to make money…and lots of it. Anyone who hosts a gold party makes 10-15% of the total amount of gold sold by those attending. For example, if all the gold sold at your party equals $1,500, you get to keep $150. Not bad just for having a few people in your home and setting out some treats. I made about $500, and I was thrilled with that amount. Come and go format. People are more likely to come to your party because they don’t have to block out two hours in their extremely busy lives for it. They can pop in, sell their gold, and leave whenever they want. Or, they can enjoy a night out with friends and stay the whole time. It’s totally up to them. People that can’t come can give you their gold ahead of time. This is a BIG plus. Tell your friends to collect all their gold, put it in a plastic baggie, and get it to you before the party. Most of the money that I made was through people who dropped off their jewelry in bags. People MAKE money at your party, not spend it. We tend to dread invitations to most home-based parties because we feel obligated to buy something if we attend. At a gold party, there is no pressure to spend anything. You go home with more money than you came with! If you’d like to host a party, start by finding a reputable gold buyer in your city, and get a date on the calendar. Spread the word among your family and friends. Talk it up! Then, don’t forget to search high and low for your hidden treasures that are just waiting to be found. Kristen Feola is a freelance writer whose popular blog, thosewhohunger.blogspot.com, supports individuals and churches worldwide who are doing the Daniel Fast. She is currently working on her first book. She enjoys cooking, riding her bike, and going rock climbing in Arkansas with her family. She lives in Springfield, Missouri, with her husband and two daughters.